Do you ever feel like quitting? I do. Knowing why it happens can help us come up with solutions and keep pressing forward toward accomplishing what matters most. What can we do when we feel like quitting? We all have our dreams and goals. When you want to accomplish something, you probably like to make a plan and pursue it. But sometimes we struggle, and sometimes we may feel like quitting. Originally, I thought of this topic in the context of someone who may be pursuing a “side hustle” in addition to a day job and/or perhaps caring for her family, but it can also apply to our career or an education program, or even our relationships or running a household and family. It may sound counter-intuitive to feel like quitting something we’re trying to accomplish or giving up on our dream. But sometimes we do (me included). Why would we want to quit? We may feel like it’s not working or that it's just too hard. Our dreams and goals turn out to be more work than we initially expected. Even if we knew it would be hard work in the beginning, once we’re in the thick of it, the work can feel overwhelming and exhausting. We may question whether what we’re doing is actually the right step toward accomplishing what we wanted. We lose confidence in our ability to get where we want to go or second-guess ourselves. There isn’t enough support from those around you. People in your life may be excited for you, but they also may have their own agenda or reasons to keep you from completing your goals, like offering distractions and obstacles, or just plain saying they don’t want you to do it. This battle can add to the exhaustion and you may think it’s not worth the fight. You may know you need a break to avoid burnout but perhaps you're worried you’ll lose momentum. The end may seem just so far away. With a long-term goal like academic programs or building a side business or even something like training for a marathon or trying to lose weight, a lot of time and patience has to go into these endeavors and no matter how much work we do, the goal still seems miles away. There’s always the option to quit, but if this dream or goal is really something that’s important to you, there are some R-words to keep in mind: Rest, Re-evaluate, Relate, Remember, Reconsider, and Reignite. Even the most energetic and committed people need breaks sometimes. This may seem scary to us. We may think we’ll lose momentum or any accomplishments we’ve already achieved, but it’s so important for us to be able to rest our body, mind, and spirit. Are you making it more difficult than it needs to be? Which parts do you like best, and which parts wear you out? Can you change your method to do more of the things you like best? Make changes to your system or look around for resources to get the help you need. Look at the process as analytically as you can to be able to simplify things. Talk to somebody. Sometimes we need an outside person who cares about us that we can trust to confide in about our struggles. Try to find someone who won’t just give you platitudes about how awesome you are, but someone who will lend a comforting shoulder, remind you what you’ve already accomplished, and constructively encourage you to keep going. A spouse may not be the right person, since they may be too close to you and try to fix the problem. You might want someone practical, empathetic, but a little more removed. You might consider finding someone who's going through the same thing you are or who has done it in the past. A person with that experience and expertise can help you think of ways to do things better or point you in the right direction. Another person that can help is a coach or therapist. They may not have experienced exactly what you’re going through, but they're trained to dig in behind what we’re feeling and help us find those answers within ourselves. Remind yourself why you wanted to do this in the first place and remember your passion you had in the beginning, as well as any reasons you came up with when you decided to pursue this goal. Ask yourself if those reasons still apply. Have you truly lost interest? Did you goals or circumstances change? Remember, nothing is fun all the time. Once you get past the initial excitement of a new thing, something else may come along and intrigue you. Be careful not to let yourself get drawn away just because something seems easier. But it’s also okay to reconsider your direction. We’re constantly changing. It's your life and your choices. If something isn’t aligning with who you are at this time, you are free to make that decision to change where you’re going and even your goals. What can you do to renew your enthusiasm for the project or goal you’re trying to complete or accomplish? Attend a conference, workshop, or meetup that will get you around other people who are enthusiastic about what you’re doing. Join a group or find a community, either online or in person. Find a buddy to be accountability partner. Find a good book by someone you respect in the field you’re working in. Learning something new can boost your enthusiasm. It may also help you overcome the obstacles that may be getting in your way. Do you ever feel like quitting at something that feels important to you? What have you done to help stop yourself from quitting? I’d love to hear your thoughts on this either by commenting below or in The Productive Woman Community Facebook group–or email me! Special offer from Grove Collaborative: Try the excellent non-toxic cleaning products (and more) from Grove Collaborative. I’ve enjoyed their products and their service so much I applied to work with them. I’m now a Grove Collaborative Influencer. What’s great about that is I can share special offers with you. Right now if you’re new to Grove Collaborative you can get a special collection of three excellent Mrs. Meyers cleaning products in their limited edition spring scent, plus a really pretty Grove Collaborative kitchen towel. I use these products every day–and love them. If you use my link (see below), you’ll get the full-sized Mrs. Meyers dish soap, hand soap, and multi-surface spray cleaner, plus the towel, for free when you sign up via my link and spend $20 on anything else on their site. Shipping will be free, too. If you’re already a Grove Collaborative customer, you can still use my link and you’ll get a little something special added to your cart, too. 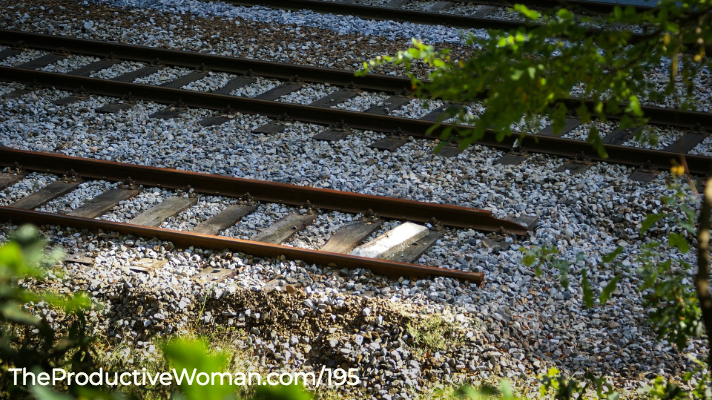 Have you joined me yet in The Productive Woman Community Facebook group? We have great conversations going on in there about being productive and making a life that matters. There's also info in the group about how to enter Thank You Giveaway going on in July–open only to TPW listeners and community members. If you're a woman who listens to this podcast, you're welcome in The Productive Woman Community Facebook group. Join us there today!